The maps we know today are rooted in an imperialist and colonial world view. Territory is regarded as property, to be owned or occupied. This has not only shaped our idea of mapping, but also how we understand the concept of land. However many different practices of designing maps exist outside of this imperialist world view. 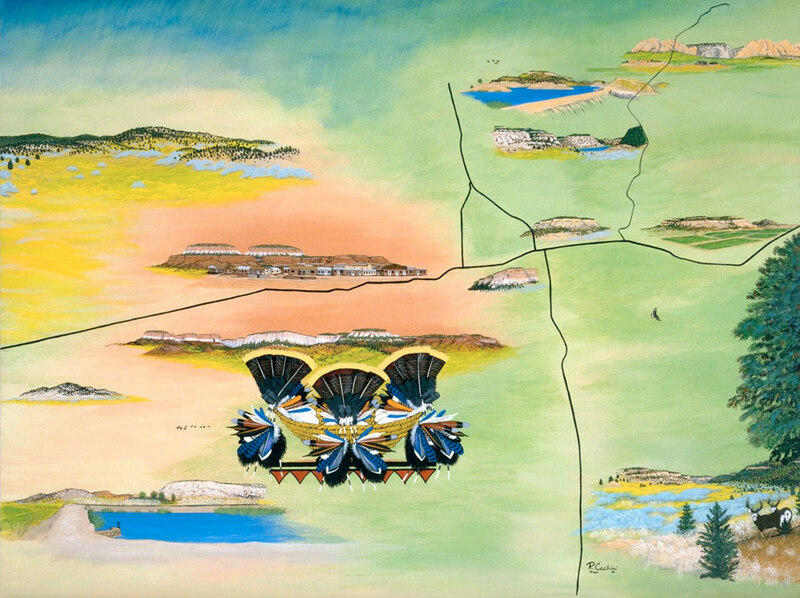 A:shiwi Map Art is an initiative of the Zuni people in New Mexico, the United States. Sixteen Zuni artists have been commissioned to reimagine the cultural history of the Zuni people through native mapping. Watch the documentary on Emergence Magazine, a great informative piece by Adam Loften and Emmanuel Vaughan-Lee. Left: Ungava gin label. Right: Inuktitut syllabics. The arctic region of Northern Canada has been home to the Inuit for thousands of years before Europeans ever set foot there. During the 1950s the semi-nomadic Inuit were forcefully relocated from their hunting grounds to missionary schools to be ‘civilized’ leading to the many problems Inuit communities face today; a lack of employment, high suicide rates, and alcoholism. Which is why there was much protest when Ungava gin, a company with no Inuit staff, used Inuit culture to promote their alcoholic product in 2013 using the slogan ‘Discovering the Inuit’. Inuk artist Stephen Puskas pointed out inaccuracies in depicting Inuit culture and accused the brand of appropriating Inuit culture to sell alcoholic beverages, with blatant offensive imagery. Inuktitut syllabics, one of the orthographies used for Inuktitut, the language of the Inuit, are used as meaningless ornaments around the label. In the campaign faux-Inuktitut is used as a typeface. What’s interesting about the ornamental ‘exotic‘ use of Inuktitut syllabics, is that the orthography itself was developed by Christian missionaries in mid-19th century, but has since become part of the cultural heritage. 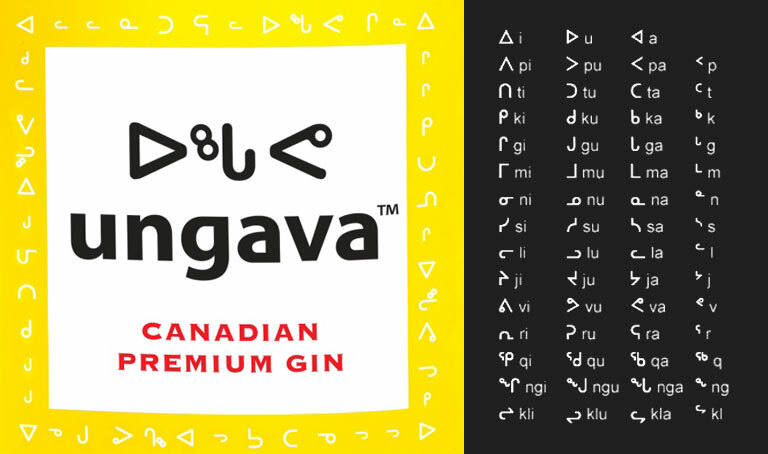 Since the complaints, Ungava gin apologized and have taken the video and images offline. Who’s Afraid of Arabic Type? On August 16, 2016, Zarah Sultana tweeted an image of a tote bag she saw in the Berlin subway that went immediately viral. The bag had Arabic type on it which said, ‘This text has no other purpose than to terrify those who are afraid of the Arabic language”. The image was retweeted 78.000 times and the design was featured on news sites around the world. The tote bag is made by Rock Paper Scissors, a graphic design studio in Haifa run by Sana Jammalieh and Haytham Charles Haddad. When interviewed by the Australian news site SBS, the two designers said about their design, “While fuddling what to write we came to a conclusion that the existence of the font and language—and not necessarily the writing—is what’s important.” The designers live in the Israeli city of Haifa, where typography is easily connected to the Arab-Israeli conflict. 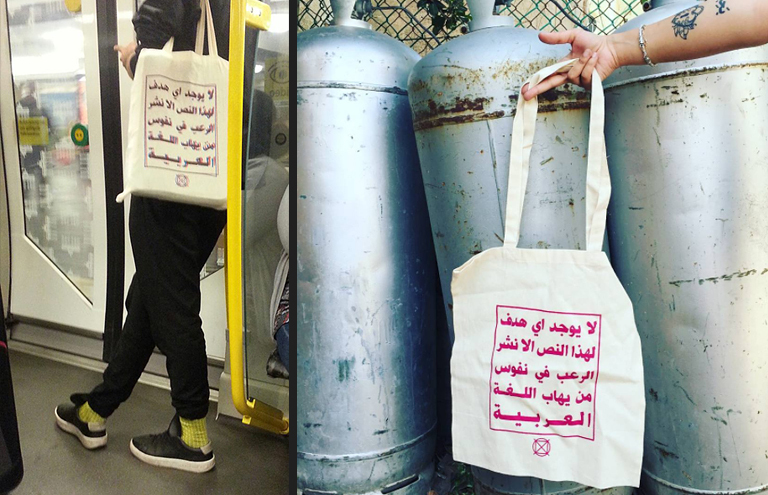 The designers continued, “We notice here that the Arabic language is starting to disappear from signs and public places.” The bag’s popularity coincides with growing xenophobia in Europe and populist politicians who brand Middle East culture as religious or Islamic extremist. The bags are currently sold out but keep an eye on their webshop, if you one. To battle the depression of the 1930s, President Roosevelt proposed massive government spending on public works. 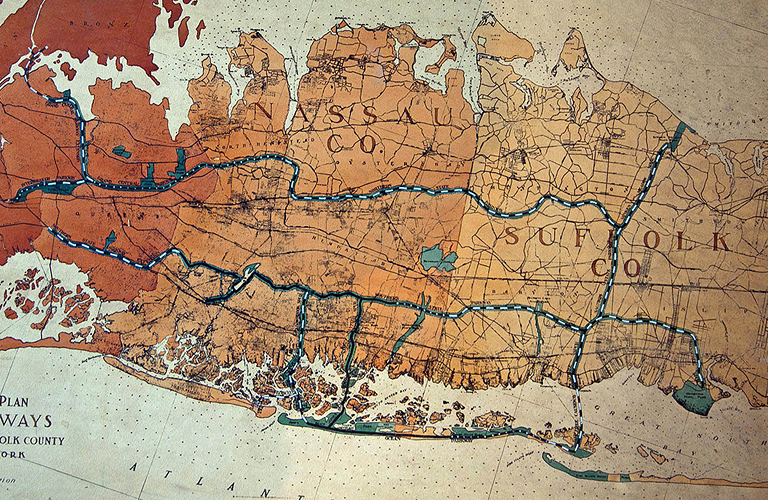 In 1933 the future master-builder of New York, Robert Moses, had a plan ready to build a network of parkways to connect the parks in Long Island. To limit the access to the parks only to the rich and white New York residents, he made sure the bridges over the parkways were so low that public buses could not reach the parks. Robert Moses did not hide his disdain for the poor and non-whites, and as a state official actively helped to segrerate public works. As Parks Commisioner of New York City he built parks, ponds and 255 playgrounds built out of reach of the poor. He also saw to it that the Robert F. Kennedy bridge exit ramp was built in Harlem, clogging the streets with cars, so wealthier neighborhoods like the Upper East Side would not suffer the intense traffic to the bridge. Urban planning decisions from that still actively shape the lives of people today. Read more on Robert Moses in the award-winning biography The Power Broker by Robert A. Caro from 1974. 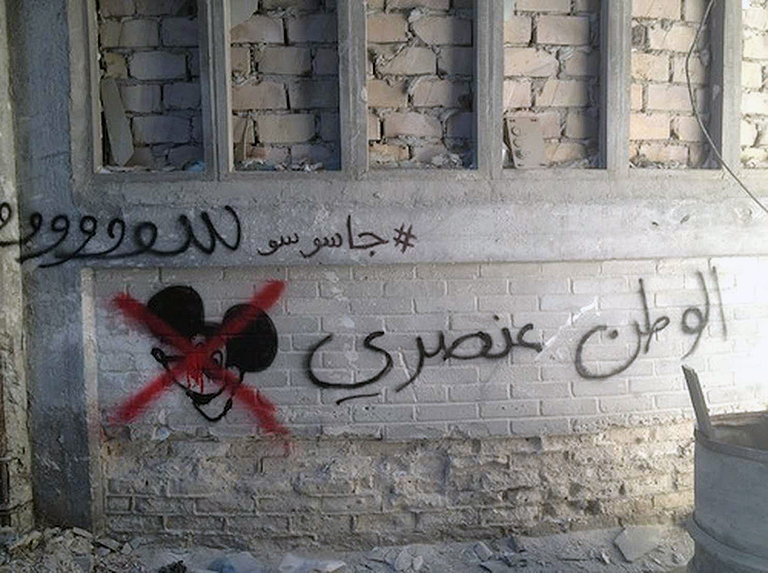 ‘Homeland is racist’, graffiti by Heba Amin, Caram Kapp, Don Karl, 2015. Photo by the artists. The award-winning show Homeland is a television series from the U.S. featuring Claire Danes as a C.I.A. counter-terrorism agent. The series has been criticised for Islamophobic stereotypes and errors in its depiction of the Middle East. When filming in Berlin in 2015, artists from the Middle East were hired to ‘decorate’ the set with Arabic graffiti. The artists quickly realised no one was interested in what the graffiti actually said. As artist Heba Amin noted, ‘Arabic script is merely a supplementary visual that completes the horror-fantasy of the Middle East’. They decided to use this opportunity to criticise the television series by writing slogans like ‘Homeland is Racist’, and ‘#blacklivesmatter’. Only after the episode aired the artists released a statement about the meaning of the slogans that had appeared during the show. The artists said, ‘It’s very important for us to address the idea that this kind of stereotyping is very dangerous because it helps form people’s perceptions of an entire region, a huge region, which in turn affects foreign policy’. In May 2016, the U.K. introduced a new law for cigarette packaging which dictates the design up to the colour, typeface, and image. 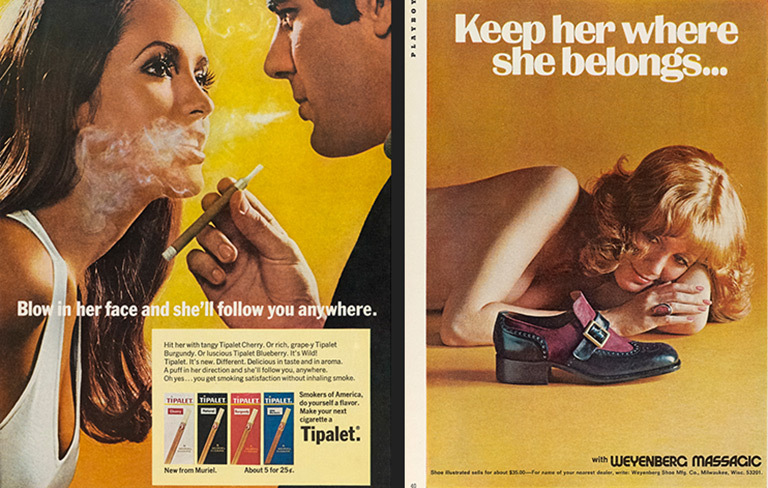 All cigarette packages have the standard design which was first introduced in Australia in 2012. The packages will be printed in Pantone 448, a colour which came out of market research as the world’s ugliest colour. Logos or branding are no longer allowed, only the brand name in Pantone Cool Grey 2, typeset in Helvetica. 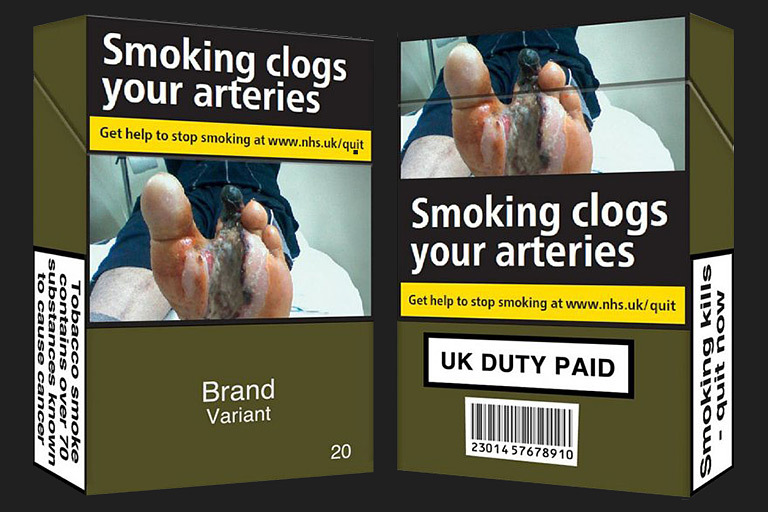 The only distinctive element will be the health warnings with photographs that cover 60% of the pack. Research showed that cigarette package designs mislead people about the difference is health risk per brand, for instance people assume light-coloured packages are healthier than dark-coloured, which is why it was decided all cigarette packaging should look the same. The same designs will be introduced in France and Ireland as well. Left: cover of the first issue. Image by Isaac Kariuki. Right: From the series Weaponise The Internet. Image by Isaac Kariuki. 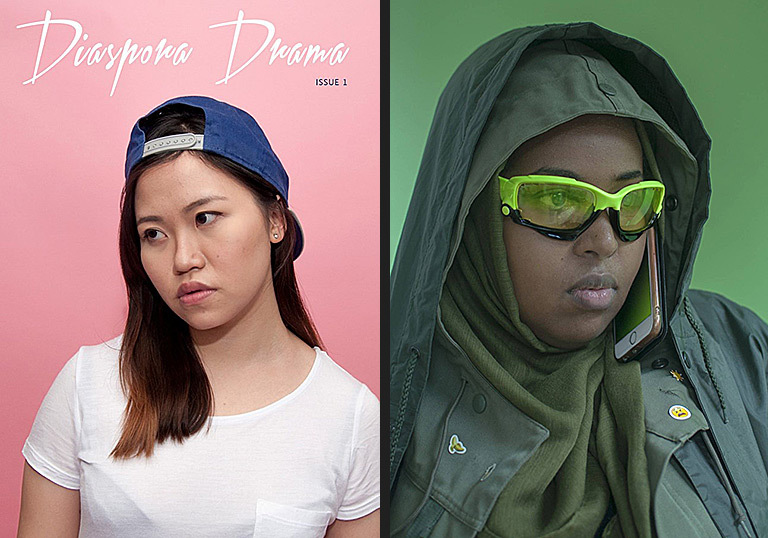 Diaspora Drama is a magazine from the U.K. dedicated to ‘offbeat creative and cool people of colour on the internet.’ It explores the identities of the children of the diaspora, young artists outside of the mold of Western society who use cyberspace to work outside the dominant narratives. Editor in chief Isaac Kariuki introduces the magazine by saying, ‘We’ll observe just how impactful cyberspace is to our generation and the safe spaces created by and for people of colour to help them navigate through life.’ The first issue features artists like Tabita Rezaire, Hassan Hajjaj, interviews with M.I.A.’s personal photographer, and future Kurdish superstar Cany Dilan. The magazine is 100% contributor based, and physical copies can be bought online via www.diasporadrama.com. Each issue comes with a ‘Punx of Colour’ mixtape.